Summer can be either be downtime or uptime for kids, families and businesspeople alike. For our members who volunteer to run CoderDojo at Farset Labs it could have been a good time to chill out. But noooooo, they’ve only gone and made more work for themselves. Design a working computer game with GameMaker. Design and build a website. 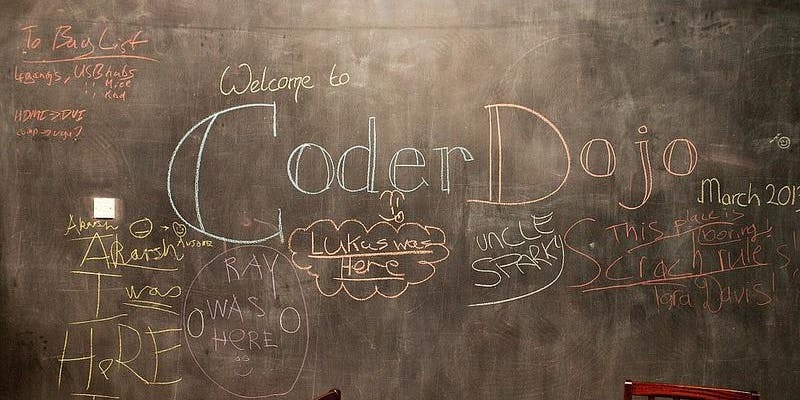 Normal CoderDojo will resume in September. See the calendar for details. Aaaand, while we have your attention, it’s worth reminding everyone that Farset has no public funding and is run by volunteers. No, wait, not quite volunteers: in fact all of us pay to be members in the first place. So if you or your contacts are interested in sponsoring great causes like our CoderDojo events, or getting behind Farset in its mission to develop everyone’s creative and technical skills, get in touch. And you don’t have to be a deep-pocketed company, Farset’s lifeblood is our recurring monthly member payments, and we are always keen for small personal donations from visitors to the Labs. ‘Nuff said about filthy lucre, now let’s get back to the… errr… ROBOTS! 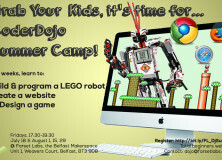 Register for the CoderDojo Summer Course here. P.S: No nasty remarks about my design skills on the flyer. I stayed up to the wee hours putting that abomination together. It’s MY abomination and I’m proud of it.